MacX Free DVD to iTunes Ripper for Mac 2.0.4 Free Download - Free convert DVD to iTunes supported videos and MP3 music on Mac. Free convert DVD to iTunes supported videos and MP3 music on Mac. Last Updated: 9/11/2012 | File Size: 15979 KB | License: Freeware | Downloads: 286 | Developer: Digiarty Software, Inc.
MacX free DVD to iTunes Ripper for Mac is specialized in converting DVD to iTunes supported formats with ideal effect on Mac OS X. With its user-friendly interface, you can rip and convert DVD to iTunes on Mac without any difficulty. Moreover, this free Mac DVD to iTunes ripper can remove various DVD copy protections like Sony ARccOS, region protection, CSS encryption as well as extract DVD audio track to save as MP3 music file on Mac. 1. Convert and rip DVD to iTunes accepted formats on Mac, enjoy DVD movies and MP3 on iTunes free. 2. It supports ripping all kinds of DVDs, including copy-protected DVDs. 3. 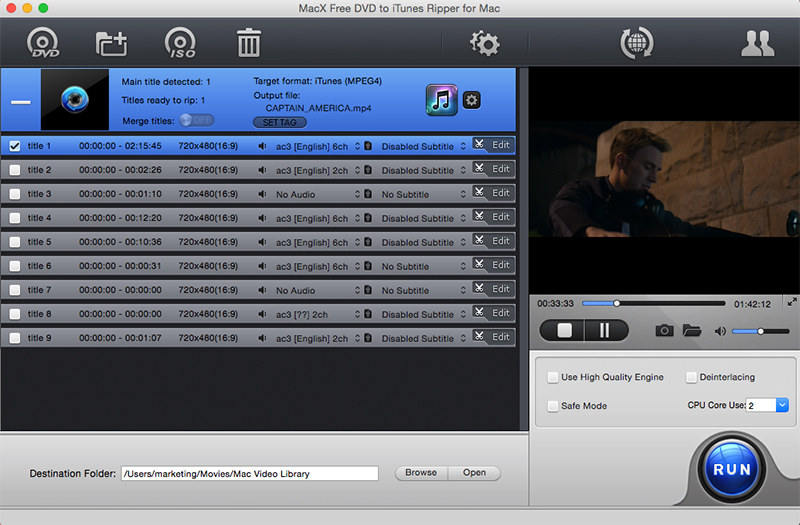 This free Mac iTunes ripper can extract audio from DVD as ringtone, take snapshot that you favor. 4. Equipped with high quality engine and hyper threading technology, even support multi-core CPU to get a remarkable ripping speed and the output video quality. 5. This free DVD ripper also offers flexible parameter settings to you to flexibly customize the converted videos, such as frame rate, video resolution, video bitrate, audio volume, etc. 6. Free download and trim video segment and rip DVD clips. 7.Built in Advanced technologies, this free Mac DVD to iTunes ripper is designed with features such as &quot;Deinterlacing&quot;, &quot;Force A/V Sync&quot; and &quot; Run as Safe Mode&quot; to stabilize the conversion and get better video quality. Statement: First, please download the orginal installation package by clicking the download link. Of course you may also download it from the publisher's website. Using MacX Free DVD to iTunes Ripper for Mac crack, key, patch, serial number, registration code, keygen is illegal. The download file hosted at publisher website. We do not provide any download link points to Rapidshare, Hotfile, Depositfiles, Mediafire, Filefactory, etc. or obtained from file sharing programs such as Limewire, Kazaa, Imesh, Ares, BearShare, BitTorrent, WinMX etc. Software piracy is theft. If you like MacX Free DVD to iTunes Ripper for Mac please buy it.